I know its a build you made lon ago... but I was checking your Toxin build and I was wondering if you made it as a Pl.8 as you said, as he seem to reach the caps for a ready-to-play pl. 10 character. Well the build of Toxin ended up coming up as an overpointed PL 8. His Toughness/Defense/Attack/Damage are all maxed out for that PL caps but his total cost is twenty pp over the PL balance. If you'd want to pull him up to a PL 10 just increase his Defense buy adding 2 ranks of Dodge Focus & increase his ranks of Protection by 2 ranks. For his Attack just add 2 more ranks to his Attack Focus (Melee) & Attack Spec. (Tentacle Snare Array) each. Then increase his Snare power to rank 10 (which would let you increase the ranks of his Strike power. Then lower the Container's Morph down to rank 1 (which really covers what it does for Toxin now that I really think about it) and that raises the Container's rank to 20 total and adds 10 pp to the total cost, making Toxin PL 10/150 pp total. I modified it to fit a more " Spider totem" feel... Mostly someone who grey up away from civilisation, ect. Costs: Attributes 30+ Skills 30+ Feats 31+ Powers 60+ Saves 16+ Combat 32- Drawbacks 4= 195 pts. Mercenary Code: Steel Commando will not give up any kind of information on his current employer no matter what, he sees this as maintaining a professional reputation. He Wants It, No Matter What: The Steel Commando is amoral and completely self-centered to the point that he will do whatever is called for, even killing someone, to get whatever it is he wants and it is only his mercenary code will overrule this behavior. Background: Heinrich Kappel was denied entry into the German army due to psychological problems and was thrown out of the French Foreign Legion after several episodes of ‘conduct unbecoming an officer’ that were due to those same psychological problems (including almost beating his commanding officer to death). Kappel then decided that mercenary would be the next best use of his ‘talents’ but after several years he realized that he needed some kind of an edge to put himself above the others in his field of work. Taking the bulk of the money he’d earned over the years Kappel approached Fabricators Inc. to build him a suit of armor and weapons system that would put him on a level playing field with most superhumans, that would be enough to give him the edge he wanted Kappel figured. It took almost six months but the those working for Fabricators were able to come up with a weapon that Kappel was happy with and it took him almost a full years worth of work, combined with a few outright bank robberies, for him to pay off most of his bill and Kappel slipped out of the rest of what he owed. Over the years collection agents from Fabricators Inc (superpowered ones of course) have been trying to collect the remaining amount due from Kappel but to date he’s managed to deal with them and keep possession of his suit. 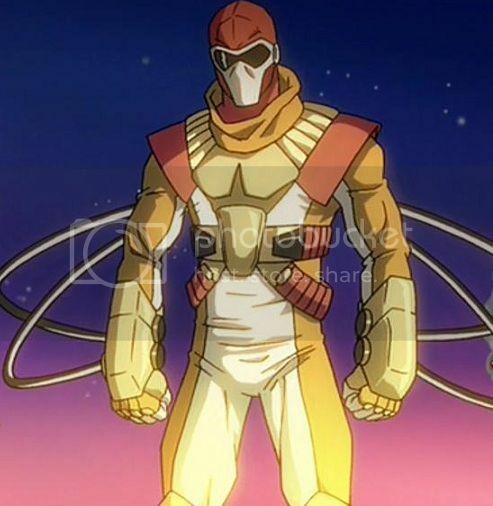 Now Kappel is known as the Steel Commando, one of the best superpowered mercenaries currently active. Only the likes of Orion the Hunter and the Jack of Blades are considered his peers. Costs: Attributes 32+ Skills 18+ Feats 14+ Powers 74+ Saves 13+ Combat 24= 175 pts. Quirk ~Challenge himself: Tachyon is always looking for ways to prove he’s better than those around him, be it physical, mentally, or intellectually regardless of the legalities of whatever activity he has chosen. Quirk ~Curiousity: Tachyon is always looking to learn new things and will break laws to do so if he feels he has to. Background: James Dupree always was a curious child; he wanted to know how things worked and why, so it was no surprise that when he went to college James was a science major with a focus on astrology (but the fact that he was attending on a sports scholarship was to most). His work was so well done that during his third year James was invited by his professor to be part of the think tank being assembled to study a meteor that had fallen to Earth that held mineral properties that hadn’t ever been seen before. It was the chance of a lifetime and James couldn’t wait to get started until he discovered that another student was joining the team, one Charlie Denver, who was James’ scholastic and sports rival. At first the pair only took verbal jabs at one another but eventually it turned physical and during the scuffle the pair fell over onto the scanning machine that was taking a new reading of the meteor and the resulting shower of energies covered the pair and they were immediately sent to the hospital. Over the course of the next few days James started to feel stronger and noticed he was healing at an accelerated rate and once he was released from the hospital he’d fully recovered from the minor injuries he’d sustained. But unfortunately James and Charlie both had been removed from the think tank thanks to their fight, though both were brought in a few times to consult on matters pertaining to their areas of science. James simply kept working on getting his degree and quietly testing the growing powers he was in possession of. A year later there’d been a series of robberies that the local police couldn’t crack and James graduated with his degree and a clear plan of what he was going to do with it and his powers. Now just over three years later most people don’t even know who Tachyon is, which is how James likes it, though he’s starting to become something of a thrill junkie for the crimes he commits. James likes to push himself and he’s starting to think that being a part-time super villain isn’t as much fun as it used to be (the problem is that James hasn’t had to deal with an actual superhero yet, then nine out of ten times his sense of competition will kick in and then things will be on). Costs: Attributes 38+ Skills 10+ Feats 9+ Powers 113+ Saves 9+ Combat 16= 195 pts. Honor: The Lady of the Lantern will keep any verbal agreement she makes. Responsibility ~Hunt those of the Darkness: As the current bearer of the Celestial Lantern, it is the duty of the Lady to hunt down any and all supernatural threats she comes across. Background: Within any group there will always be conflicting ideas on how to deal with any problem and while not every way is right, not every way is wrong. This is what led to the creation of the White Lotus Society in the late 1800s, just a few decades before the turn of the century. The White Lotus Society originally was part of the Order of Light, though they broke off ties from their parent group over differences of the Chinese chapter’s ways of operating compared to the Order’s. One of the more outstanding differences was that the Society chose to allow specific agents to wield certain mystical items that were of use in their efforts against the supernatural while the Order preferred to lock them away in hidden vaults so that nobody could fall to possible temptation on how to use said items. Eventually several of the Society’s members traveled to America after certain items and spirits were then being brought across the oceans there (sometimes unknowingly while others were fully aware of what they were bringing), among them was a man known simply as Jun who was well known for his skill in hunting demons especially after taking possession of the artifact known as the Celestial Lantern. Jun was hunting down a pair of demons that had possessed a brother and sister who fled to America to seek their fortune, but this is not that story. That tale can be told at another time but needless to say that Jun eventually succeeded in banishing the two demons but by that point he’d spent many years in America and had fallen in love with a young girl whose family had came there as well and she had no interest in returning to China. So Jun stayed in America, raising a family while hunting all kinds of new supernatural threats as well as some more familiar in his local town of San Francisco and he taught his sons how to use the Celestial Lantern in their family’s cause. And so that is how it continued for several generations, child being taught by parent the secrets of the Lantern as well as how to fight supernatural evils that walked the earth. That is until the late 1980’s when the Lantern’s current wielder, Jack Wu found himself in over his head facing the Lord of the Vampires: Dracula himself and as the final pints of his blood were running from his wounds Jack cast a pair of spells; one spell that sent the Celestial Lantern away into an other-dimensional vault he’d found several years ago only to come out to his daughter upon her twenty-first birthday, and the other imparted all of Jack’s knowledge of fighting and the supernatural world into the Lantern. Sandra Wu grew up never really knowing her father aside from the few stories her mother would tell her so when she was confronted by the arrival of the Celestial Lantern while walking home from work on the eve of her twenty-first birthday the knowledge that it imparted upon her left her shocked to say the least. Though she did decide to take up her family’s legacy after thinking on it for a few days and following some trial and error efforts on her part Sandra quickly found herself becoming more and more comfortable with her role as a mystical protector or the realm of Earth and she is starting to develop a reputation in the supernatural world and the world of super heroes as someone of note. Costs: Attributes 10+ Skills 10+ Feats 15+ Powers 74+ Saves 11+ Combat 20= 140 pts. Motivation ~Greed: Celsius is driven to get as much money and other valuables as she can lay her hands on. Background: Celsius’ past before her debut as a super villain isn’t known at this point. She simply started her criminal career by robbing four banks in Arcadia in a single day despite the efforts of local super heroes. Costs: Attributes 20+ Skills 19+ Feats 20+ Powers 111+ Saves 21+ Combat 22- Drawbacks 2= 211 pts. Long Memory: Talisman holds grudges on those that interfere in her plans. 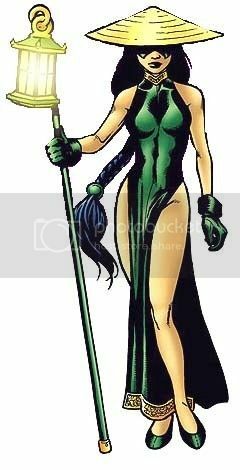 Motivation ~Power: Talisman is always looking to increase her personal power by any means she deems needed. Background: Pamela Duquesne was raised in what seemed to be an ordinary suburban home but behind that façade lurked a dark shadow; the Duquesnes were leaders of a cult that was devoted to dark forces and they raised their daughter to be a witch as they were. Pamela grew up to be a cruel, spiteful girl who took to her teachings readily and soon was the unofficial third in the cult’s hierarchy. On her eighteenth birthday, Pamela was formally inducted into the cult and she readily spoke the oaths and as she finished the last words those in the cult most loyal to her made their move; binding her parents spell casting abilities before sacrificing them in Pamela’s name. She then assumed full control of the cult for several years, the whole time increasing her knowledge of spells and rituals in first hand use until she could learn no more from the tomes of the cult. Pamela then destroyed her followers, insuring that none of them would ever be able to challenge her and moved on to study under many a master or mistress, really anyone who was willing to take her on as a student and Pamela was willing to go any route to gain more power, from making blood sacrifices or corrupting her tutors with her charms, none of it mattered as long as she gained more knowledge and power. At this point however Pamela wants more than dusty tomes and barely lit rooms, she wants bright lights, big cities, the attention of beautiful people and personal riches. And to gain all those things Pamela was more than willing to turn to a life of crime, which she found surprisingly easy to adjust to as it’s just a different form of power to master in her line of thinking, and with her mastery over hellfire and other magical abilities Talisman, as Pamela took to calling herself, is more than a match for many superheroes. Costs: Attributes 18+ Skills 27+ Feats 21+ Powers 189+ Saves 10+ Combat 40- Drawbacks 5= 300 pts. Body Upkeep: Interface must subject his robotic body to maintenance almost every day else he might suffer a malfunction. Computerized Brain: Because of the technology that was used, Interface’s mind can be hacked and controlled like a normal computer. Temper: Interface can become enraged if reminded of the things he cannot do now that because of his robotic body. Background: Rutger Eisenmann was a mercenary and was very good at his job; body guarding work, infiltration of locations to retrieve certain information or goods, even assassination. He did all of it without hesitation for whoever was paying him at the moment and he didn’t fail to get the job, whatever it might be, done. Eventually Rutger’s reputation attracted the attention of Fabricators Inc. and they hired him to oversee shipments to clients and protect several of their labs where crucial research was being done. When Foundry robots came crashing in, Rutger fought like a tiger to cover the escape of the scientists under his protection resulting in his taking several serious and life threatening wounds before reinforcements arrived and managed to destroy the remaining invaders. Rutger was wounded so badly that he should have died but the Fabricator, in gratitude for the man’s commitment and in need for a test subject for certain procedures, decided to save him. Scientists salvaged what they could of Rutger’s body – the head and the upper part of the spine – and grafted them into a cybernetic body. It took several months for Rutger to learn how to fully use his new body, in part because the scientists kept developing upgrades and new parts to install onto it, but eventually he was able to master his new form. Although he was bitter over the loss of his flesh and blood body, Rutger had to admit that his new one had it’s merits – he was far stronger and more resilient to injury than he ever could have been originally. Given the code name of Interface, Rutger went back to work for Fabricators Inc. It was good work; they paid well, and more importantly, they performed the almost daily maintenance his new body needed. But after several years it became that Rutger wanted more than Fabricators Inc could give him, they are a subtle organization that prefers stealth and behind-the-scenes workings while Interface (who is certainly a master planner) is more of a combat machine that is ready and able to get in the thick of superhuman battles and he longed to declare himself publicly and match wits against the so-called “forces of good.” So when the differences became all too clear for anyone to ignore Interface suggested that he leave Fabricators Inc to strike out on his own. He’d contract with them for maintenance services as well as refer possible clients to them as well as have them be his go-to service for his technological needs. The powers that be at Fabricators saw the benefits of such a deal and agreed, even going as far as to help Interface set up several bases at a lower commission rate in recognition of future business he would send to them. Since that time Interface has go on to become a power in the underworld in his own right. Hungry for power and glory, he hopes to one day take over the entire world but for now the city of Arcadia will do as a first step. Shameless plug here but after an almost 2 year break I've managed to add another chapter in my Story Hour Thread, ya know for those out there who might kinda remember that I did a bit of writing set in the WOF setting. Costs: Attributes 34+ Skills 32+ Feats 15+ Powers 40+ Saves 18+ Combat 32- Drawbacks 4= 167 pts. Paranoid: The accident that left him with horrible facial scars also left Binder with a newfound paranoia of being sabotaged by his fellow AEGIS co-workers and even after he was fired from that organization he feels that they were keeping tabs on him. Thus he is always goes through various ‘checks and once-overs’ during the course of his day. Motivation ~Revenge: Binder feels that his co-workers were jealous of him and sabotaged his work, which left him with hideous facial scars and his criminal activities are so that he can avenge himself on those who wronged him. Background: Earl Whitaker was an AEGIS scientist who was caught stealing AEGIS technology for his own personal use, namely creating a new industrial grade adhesive, when his home exploded due to improperly housed chemicals, scarring him horribly. 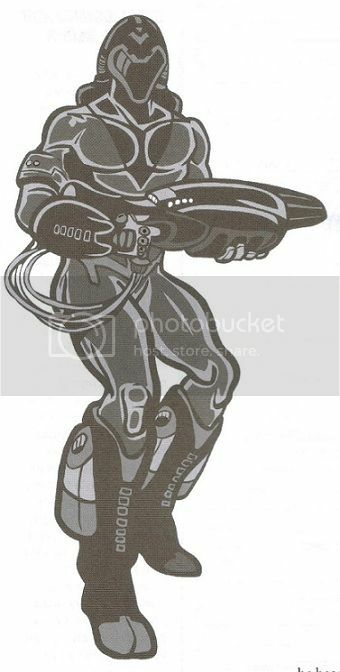 Discharged from AEGIS, Whitaker became paranoid and spiteful, developing a suit of armor based on the MAX armor and using his new adhesive to become the costumed criminal Binder. After a few outings as a supervillain (with a couple almost captures to his credit), Binder realized he’d need backup to be able to accomplish his goals more effectively so he hired the Cybertribe to hack into AEGIS’ computers and get the files of every low-level super-criminal active in the U.S. and from the information in the profiles the AEGIS psychologists had put together Binder selected the crooks and criminals he thought would best work as a team under his leadership; the Sinister Syndicate. After recruiting Bonechill, Bloodaxe, Phosphorus, Doctor Breakdown and Ankylosaur, Binder quickly put them to work as a team for hire that was willing to take on any job. A few months after putting the group together the criminal Slick sought them out to join and after a couple tests of his skills and powers he was allowed to join. Over a few years they worked together for many a criminal mastermind and while each was paid well Binder made sure that 25% of their total pay was set aside for the team for various needs. By this point the Syndicate has it’s own set of bases across the country where they can hide out after a job as well as relax with all the comforts of home. From time to time the Syndicate will pull a job or two just for their own profit but they’re still willing to work for anyone that can pay them for their services. Costs: Attributes 4+ Skills 5+ Feats 17+ Powers 100+ Saves 16+ Combat 22- Drawbacks 4= 160 pts. Hates Cops! : Having been a two-bits hood for years, Bressler has an intense dislike of the members of any and all law enforcement agencies. So much so that if confronted by any he will act irrationally and needlessly endanger himself (as well as the team’s current plan) and try to create trouble for them. 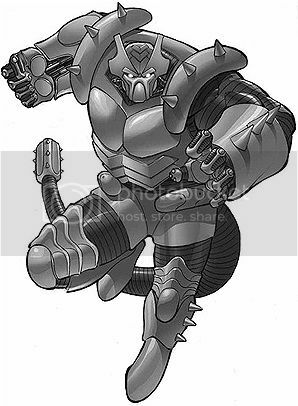 Background: Paul Blesser is a small time thug and bully who had the extraordinary good luck to come into possession of a high tech suit of battle armor that was accidentally left behind after an AEGIS raid of a Foundry warehouse, becoming a high paid mercenary and supervillain, Blesser took the codename Ankylosaur (which he can barely pronounce) due to the armor’s large spiky design and the large spiked tail which is the apparatus' primary weapon. He spent the next six months as a knock-over guy, literally knocking over the back walls to bank vaults and taking off with as much of the cash as he could carry and generally developing a reputation as a strictly small-time kind of guy. Until Binder found him and offered him a place on the group the rogue agent was putting together, to which Blesser couldn’t agree quickly enough; it was his dream to become part of a team of villains after he’d gained the armor and it was about time one of them finally snatched him up (they must have been fighting with one another over him….). Since joining the Sinister Syndicate, Ankylosaur hasn’t regretted it yet. He loves being the team brick and loves throwing down in the middle of big fights and making off with the all the cash while staying out of jail. Costs: Attributes 14+ Skills 11+ Feats 10+ Powers 82+ Saves 11+ Combat 28= 156 pts. Fighting Is His Business: Bloodaxe seems to wholly enjoy physical conflicts. So much so that there have been times he’s ruined the Syndicate’s plans by extending the length of a fight he’s involved in. Temper: Bloodaxe has a short fuse and is easily angered. Background: The past of the current wielder of Bonereaver is unknown, including his name. Somehow Bloodaxe managed to take possession of the mystical axe, Bonereaver, from the criminal known as the Headsman, Bonereaver’s former owner, while he was incarcerated at Gramercy Island. Bloodaxe’s actual ‘debut’ was against Troll of the Sentinels and it was a short fight thanks to Bloodaxe’s inexperience but he did mange to retain his freedom. 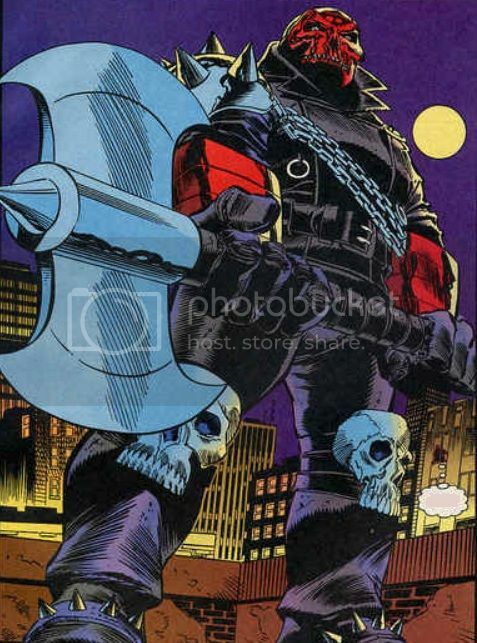 From there Bloodaxe often appeared across the country doing random acts of destruction which forced him into conflicts with various heroes for a few years until Binder offered him membership in the group he was assembling, the Sinister Syndicate. Bloodaxe often works in tandem with Ankylosaur acting as the front-line force of the Sinister Syndicate, and is the one who acts as the major distraction for the group’s plans, a job he enjoys as it seems that simply fighting is a major reason for his criminal ways. Costs: Attributes 24+ Skills 14+ Feats 11+ Powers 56+ Saves 14+ Combat 32= 151 pts. Payback: Bonechill will tirelessly hunt down anyone who wrongs him, even if it only a perceived wrong. 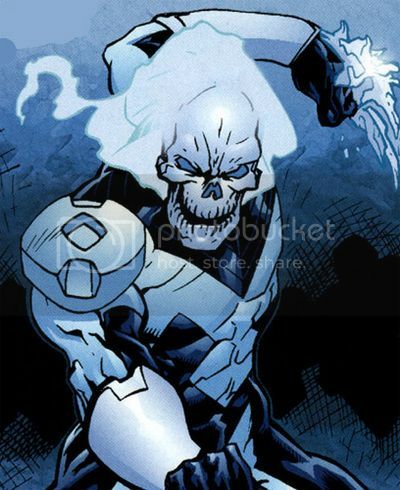 Unique Looks: Bonechill’s head is hairless and its skin has shriveled, clinging tightly to his actual skull, and has taken on a pale blue discoloration in color. Background: Kenneth Yaeger was a crook caught in a cryogenic accident from equipment in ASTRO Labs that was based on designs of Madame Zero that gave him the ability to project intense cold but was left with a skull face from the chemicals he was exposed to. Blaming the other members of his crew for his disfigurement, Yaeger proceeded to hunt them down and execute them for their apparent betrayal. This brought Bonechill, as Yaeger now called himself, to the attention of the Raven as she started to investigate the deaths of Yaeger’s former associates. She finally confronted him on a rooftop and following an intense battle Bonechill ended up at Blackstone. He managed to get released based on his lawyer arguing that the accident cause him to suffer from temporary insanity but Bonechill simply returned to his old ways and tested the waters so to speak in the world of supervillains; soon developing a reputation as semi-respectable operative for those looking to hire him on. Bonechill also would occasionally pull a simple robbery or three to maintain his lifestyle in between jobs. After a few years of operating this way Bonechill was approached by Binder with an offer of full-time membership in a new gathering of supervillains. Intrigued by the idea of getting in on the ‘ground floor’ so to speak, Bonechill agreed.